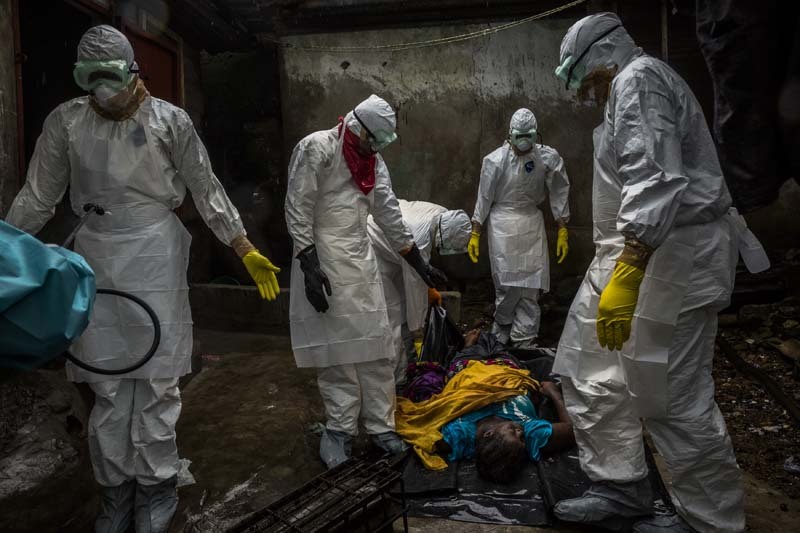 MONROVIA, LIBERIA - SEPTEMBER 18, 2014: Members of a Liberian Red Cross burial team, under contract from the Liberian Ministry of Health, remove the body of a suspected Ebola victim Lorpu David, 30 on September 18, 2014 in the Gurley street community in central Monrovia, Liberia.“We came here for the husband last week, we’re back today for the wife, and maybe next week we’ll be back for the children,” said Alexander Nyanti, 23, a burial team member who was recovering the body of Lorpu David, 30, in a central Monrovia neighborhood off Gurley Street. A week earlier, his team had visited the same house to retrieve the body of her husband, Sam David, the first Ebola death in that community. The couple shared one room with their two children and the wife’s younger sister. “The little boy is not feeling all right,” John Sackie, the community’s chairman, said as four members of the burial team pulled Ms. David out of a dark room in the back of a house, each grasping a limb. But others from the community had clearly been exposed. Teddy Momo, 36, the late husband’s nephew, said he had taken the ailing Ms. David to one of the city’s three Ebola treatment centers, riding in the front passenger seat of a taxi as Ms. David shared the back seat with her two children and sister. Turned back because of a lack of beds, the group took the taxi back to Gurley Street. But Ms. David slipped and hit her chin on a rocky path leading to her house. A neighbor carried her home where she died immediately, Mr. Momo said.